We have another brand new addition to the Hauspanther Collection by Primetime Petz and I’m pretty excited about this one! It’s our new Scratch Pole Adjustable Under-table Cat Scratcher, a brilliant little invention that just might change the world for cat scratching. The Scratch Pole is a streamlined cat scratcher that fits securely under any standard table or counter. The pole extends and is held in place with tension so it doesn’t require a large base to keep it from tipping over. 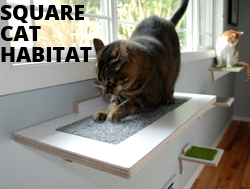 This is a great way to place a cat scratcher in an unused space or to put one in your cat’s favorite place, like under your desk. The Scratch Pole comes in two styles, the Deluxe featuring a full seagrass rope wrap and the Dual Surface with half seagrass and half felt scratching surfaces. Both have matching seagrass toys that entice kitty to play and scratch. You can pre-order both versions of the Scratch Pole now from shop.hauspanther.com and they will ship at the end of August. 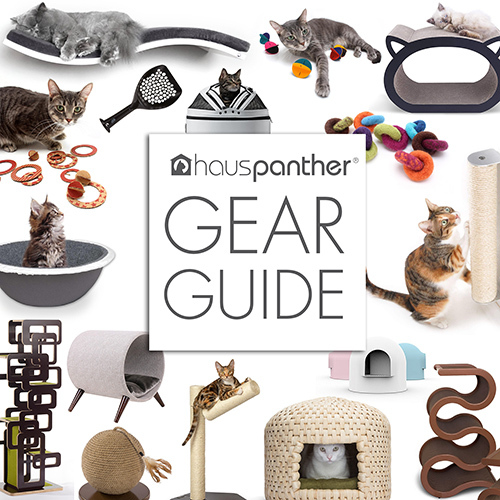 Be the first to get this ingenious new cat scratcher! The Deluxe is $29.99 and the Dual Surface is $24.99. The Scratch Pole is Patent Pending. What a genius idea, Kate! We’ll probably never know how many cats will remain in their homes because of this, but we can have confidence that many will! Thank you for a wonderful product! Hi! I ordered one for my table, but would really have liked to see a below countertop height one. Meaning expands to 35 ” (Standard cabinet height is 34.5 “) I have an overhang/bar that would make a great place for one, but these are too short. I’m guessing my monsters will love it! Great idea!! We will get working on that! Same here! 4 cats, no table but have huge island with 6 in overhang on both sides. Need ones that are taller.